Well drained soil rich in organic matter, but with no manure added prior to planting. Use well aged compost or vermicompost to condition compacted soil. Tops tolerate light frost; roots survive hard freezes. Soil quality is more essential that supplemental feeding. Chives, Potatoes, Leek, Lettuce, Peas, Radish, Rosemary, Sage, Tomato, Onion and Onions. Sow direct into soil in spring. Make a second sowing for a fall crop in mid to late summer. Keep plants well weeded to reduce competition for nutrients are water. 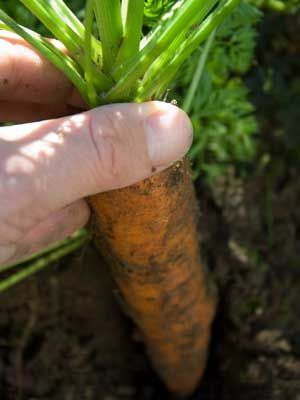 Mulch over the tops of mature carrots to keep their shoulders from turning green. Can be harvested over a long period, but the longer plants are left in the ground, the more likely they are to be injured by insects or animals. Viruses, nematodes, and soil-borne diseases can cause roots to become gnarled or misshapen. Try fast-maturing varieties to sidestep these problems.